An anime style hack-n-slash adventure, RemiLore: Lost Girl in the Lands of Lore is almost a bonding experience between the characters involved. Remi finds the book Lore and mistakenly gets them both in a world that is infested with mechs. Your goal is to find your way out of this dangerous place. There are tons of weapons and spells at your disposal. Collect more powerful weapons as you advance, and upgrade your spells to create a better chance at survival. If you die, you must restart the chapter but will keep anything you’ve collected and upgraded. The action can be fast-paced but at times annoying. You collect desserts as you kill enemies and destroy objects. They serve two purposes, to refill your mana and to also use as a currency for upgrading and obtaining items. It made collecting them that much sweeter (pun intended). Progression and Unlockables — The ability to obtain permanent upgrades, even through death, makes grinding less boring. You get stronger which each attempt and eventually, the difficulty is lowered with that progress. You still won’t feel like you get overpowered. There is always still that chance to die and have to restart the chapter. Even though it can be quite repetitive, collecting new weapons is always a blast. Certain modes completed will also result in new costumes. There seems to be no end to unlocking new items. This results in hours upon hours of playtime. It’s basically as much as you can handle. Whacky Anime Humor — To go along with unlockables, a bunch of the weapons and costumes are based on humor. While there are some great-looking weapons, there are also crazy ones that are very creative. For the gauntlets choice, you can find anything from footballs to juice boxes. There are too many examples to name, but it made collecting them very entertaining. Costumes can be equally as funny. Running around in a bunny outfit while attacking with a carrot sword is pure entertainment. In the custom mode you can actually pick what spell, costume, and weapon you are loaded with. Loadouts — I’m a big fan of elemental effects. From slowing down time to a bolt of lightning that destroys everything around you. There are enough spells to play with to keep you happy. 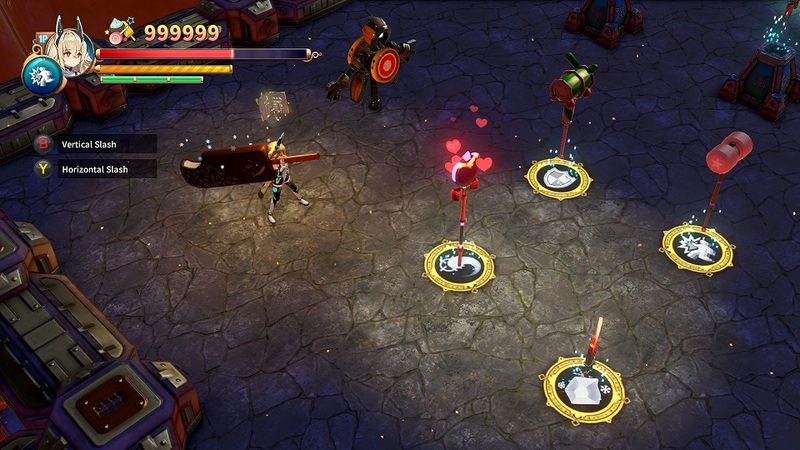 The weapons will also have their own effects, such as mana drain and extra damage versus mid-tier bosses. There are a lot of unique traits to combo and I feel like it helps ease the repetitive gameplay a bit. My absolute favorite loadout is the heart staff that drains mana combined with Lightning Bolt. I also like Bullet Onslaught for bosses, it makes them easy fights. There are certain spells that I feel are worthless garbage, but you’ll find out yourself which ones these are. They seem to do nothing to help you defeat the enemies. 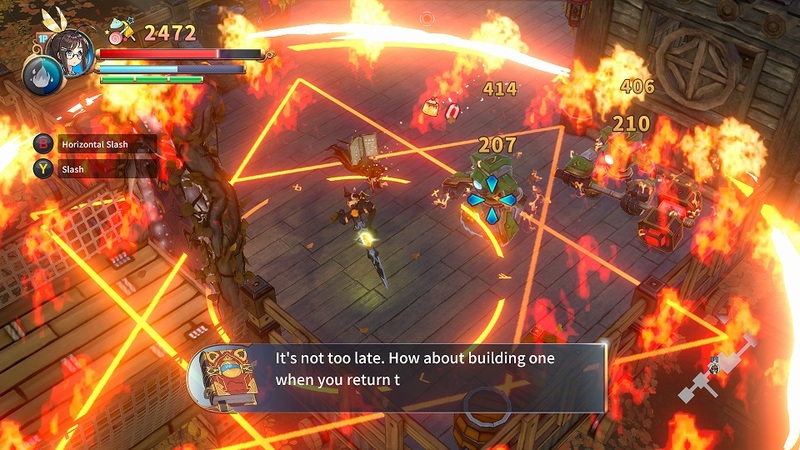 That is why I really think this combat system belongs to an RPG-style game versus a rogue-like dungeon crawler. I think it’s fantastic but in the wrong genre. Voice Acting — At first I didn’t mind the conversations happening, but very quickly I started to despise every word exchanged between the characters. They are extremely loud, even when I turned down the volume specifically for the voice setting. I did this because one of the tips during loading was about how to turn it down (it was directly referencing speech). It didn’t help, as Remi and Lore basically yelled the entire time. They weren’t angry, it was just an exaggeration of emotions. This is all in Japanese, as there is no English language option. Instead, you must read the subtitles and they seem to always appear while you’re busy battling enemies. It was too difficult to read while all the action was going on so I just gave up. Getting Stuck — There will be times when you’re in a smaller area with a lot of enemies. You can get stun-locked and won’t be able to do anything but watch your character perish. Besides a lot of annoying enemy attacks that happen throughout the game that can blindside you, this particular instant death seems more like a glitch. It can be depressing when it happens on the third part of a world you’re in. Also, certain breakables on the floor will get you stuck for a second, resulting in being hit by enemies you were attempting to dodge. Luckily it can be rare and you may never experience it, but when it happens you’ll be wanting to quit playing. Rating System — Once you’ve beaten an area, you will be rated based on your time, combo, and damage taken. The fault of this system is that most of the time it seems unfair. Taking any hit at all will almost always cause you to drop your S ranking. A stray bullet you didn’t see can ruin it all. The other part I really don’t like is that if you use a spell and it kills everything in under a second, you won’t get a good combo grade. I feel like if I beat a whole room that quickly without even hitting anything then I should be awarded the S ranking. Instead, I have to just hit things without using my spells in order to guarantee I have a high combo. It’s a bit of an upwards battle at times. There is something special about RemiLore, yet there also seems to be a lot missing. It’s like having a pro athlete that has great talent but happens to be on a bad team. What could have been made into an epic RPG, was simplified into a bland system of repetitive gameplay. The main story can be completed in an hour and a half, which will happen when you’re upgraded and fully understand the combat. One of my runs ended after only 53 minutes. This isn’t a one-and-done title, you must complete it numerous times to get everything it has to offer. Unfortunately, it doesn’t really offer all that much. If you don’t mind grinding through to unlock everything, then it’s a pretty enjoyable experience. If you’re an achievement hunter you will probably like how you must obtain everything in order to get all of them. This is especially true with beating the game while only using a specific type of weapon. It encourages you to do everything possible in the game. However, if you don’t like replaying things numerous times, then it will be a short experience with a “that wasn’t worth it” feeling. The biggest sting here is the price tag which, unless you fall in love with the combat system, may lead you to feel dissatisfied with your purchase. 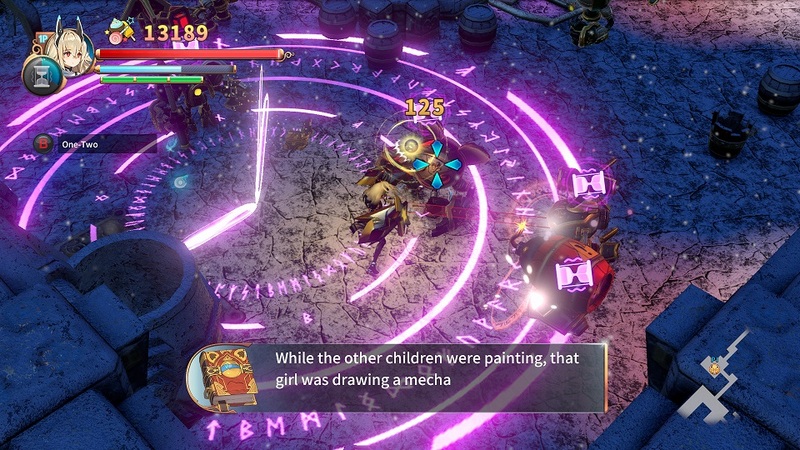 RemiLore: Lost Girl in the Lands of Lore was published byNicalis, Inc. and developed by Pixellore Inc./REMIMORY on Xbox One. It was released on February 26, 2019, for $39.99. A copy was provided for review purposes.